The removable shot blasting head is excellent for treating the potential danger of aquaplaning and grip loss. 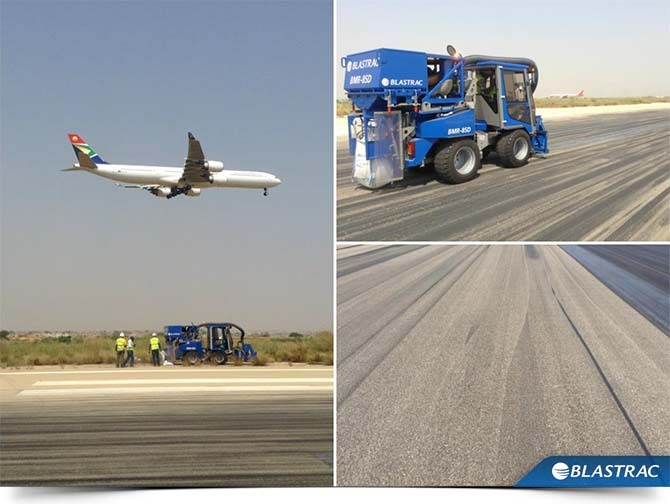 This machine is particularly well known in the airport industry to remove rubber on runways. It also improves surface texture which increases grip. This helps to prevent accidents and runway excursions. The BMR-85D has a daily performance of around 2000 m² on runways. The Blastrac BMR-85D purchased by ENANA (airport authoritiesin Angola) for the purpose of rubber removal at the airport of Luanda, was shipped to Angola in a 20ft container with all the required equipment. At the moment, they have a blasting job of 10.000 m² with the potential to blast the whole runway.